Normally, when robots are designed there is a specific task in mind. Once that task is specified, the designer can choose an appropriate robot shape for performing the task well. Yet for many robotic missions this approach is insufficient. There is a class of missions that by their very nature are Unknown Challenge Missions. In these missions, we must commit robot hardware to the task before knowing exactly what it is that these robots must do. Examples include disaster recovery and other first response tasks, intelligence gathering missions, troop support missions against an adapting adversary, and planetary exploration. module types, that can be rearranged into a robot morphology to accomplish the desired task. Observing that such systems often assume that the robot body will be constructed of modules, which are generally heavy and expensive we suggest a less costly and more mechanically efficient alternative: constructing robot body part from self-hardening foam. Foam synthesis uses our synthesiser cart, which is based on an off-the-shelf insulation foam, and a simple valve constructed from a spring-clamp. These are mounted on a moving platform constructed for the Mini-PR2 robot, which allows holonomic motion in the plane. Finally, an additional actuator allow the operator to control the elevation of the foam-spraying nozzle. A laser pointer is mounted to the nozzle to simplify aiming the foam spray. The actuators and microcontrollers that make up the robot are pre-assembled in clusters of three CKBots each. These minimally mobile clusters have a magnetic attachment face on their ends, to which we attached interface plates made of foam-core with 5cm bolts pointing out of the surface. The two face-plates also hold down a splash-protector nylon sheet which protects the actuators from foam splatter. The bolts get embedded in the foam synthesised body parts. 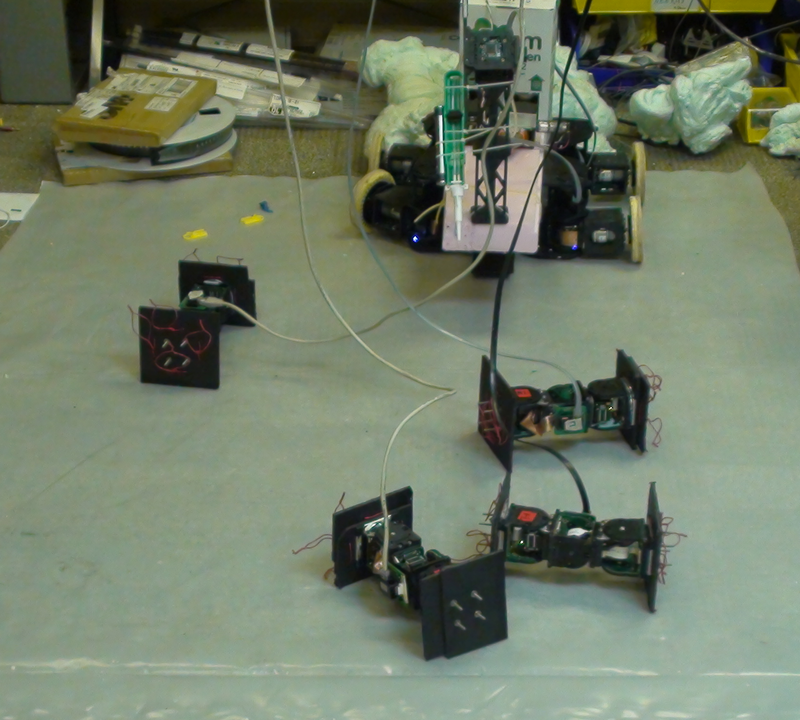 We built and operated two different robot morphologies starting from the same initial cart and cluster configuration. 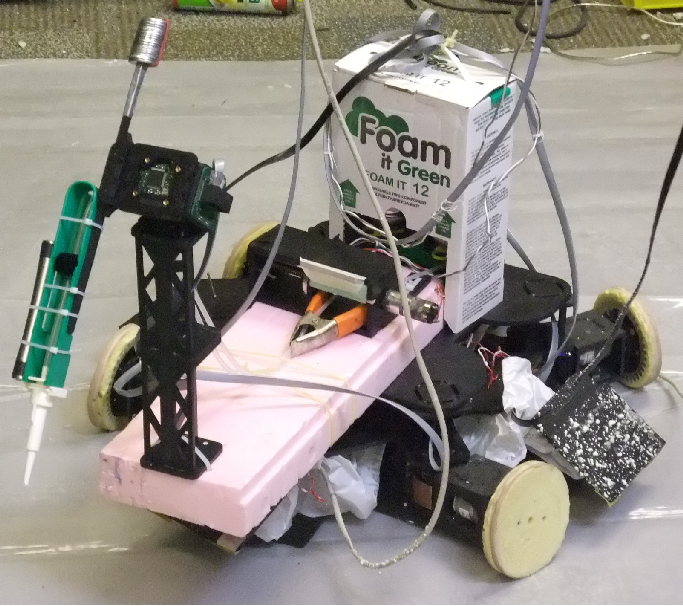 We used a simple motorised wheel and passive skids to form a low-cost wheeled robot that can carry a bio-/sharps- hazard away by encapsulating it in foam. Picking up broken glass and needles with a robot arm would not have been feasible. Foam can be used to change the environment. For example, in fire-fighting or hostage rescue situations it is critically important to control entrances and exits of a building. The robot can easily jam doors and windows in the closed or open state by deploying foam. S. Revzen, M. Bhoite, A. Macasieb, and M. Yim, “Structure synthesis on-the-fly in a modular robot,” in Intelligent robots and systems (iros), 2011 ieee/rsj international conference on, 2011, pp. 4797-4802. Oct 17, 2011 | Filed under CKbot, Uncategorized.